Here’s Why TCU Is An Irresistible Ancillary For Your Rubber Machinery And Worth Your Investment. TCU or Temperature Control Units are ancillary equipment to your rubber machinery that control process temperatures during rubber processing. During rubber processing, you continually seek optimal temperatures for the best product quality. A TCU achieves temperature control by circulating water or an oil based fluid through the process application (in a closed loop). This results in heating of the application and temperature control of the process. Temperature control units service a single process at any one time. In rubber industry, water is most popular circulating media. For example, you have Three-Zone Water TCU’s for your internal mixer where One Zone supplies water to the Rotors, Second Zone to Drilled Sides (or Mixing Chamber) and Third Zone to Discharge Drop Door (and Floating Weight, RE Plates as appropriate to the mixer model). 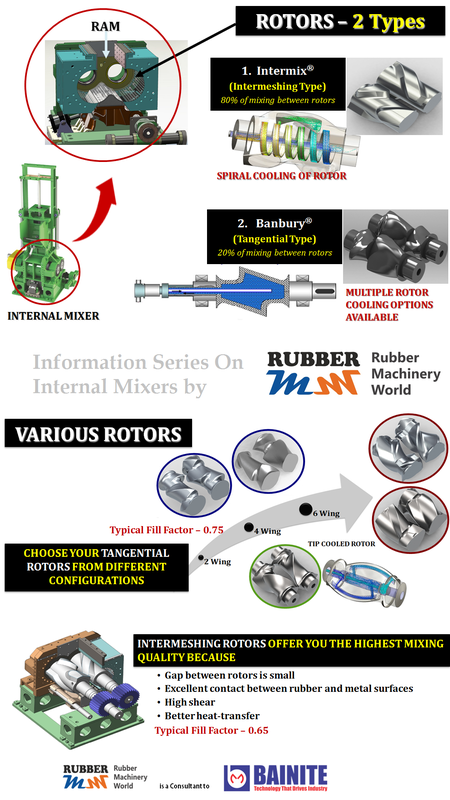 Usage of TCU in an intensive internal mixer is found to improve carbon black dispersion, eliminate first-batch-effect, maintain batch-to-batch consistency of your rubber mix compound, increase productivity, and reduce machine stress (which in turn increases the life of your internal mixer). Similarly, you have 4 or 5 Zone TCU’s for your Extruders, where each of the zones supply water to screw, forward and rear barrels, die head, feed roll, etc as is required for your rubber extrusion process. Or you may have Two-Zone TCU for open two-roll mixing mills where each zone supplies water to your peripherally drilled or cored rolls. Most Rubber Calenders also have TCU supplying water to the rolls to control the calendering process temperature. A properly installed, operated, and maintained TCU system gives you years of reliable operation. Each TCU is a self-contained system consisting of a centrifugal pump, electric heater, cool/vent solenoid valve, electrical control, including a PID microprocessor controller and thermocouple along with standard safety devices like a mechanical over temperature safety thermostat, a pressure relief valve, motor overload protection, a low pressure cut out switch, etc. Temperature Control Units come both in portable and robust sizes (depending on the application) with a variety of different control instruments, heater sizes, and cooling vales. And you are right when you imagine that the portable TCU’s are visually appealing and popular because of their compact size. At your installation site, you need to provide adequate water (from portable or central chillers or towers) to these TCUs from your plant water supply source. Check your manufacturer’s operations manual to verify the recommended water pressure requirement. This is important because lower than recommended water pressure can cause pump cavitations while excess pressure can damage internal components. The pump in your TCU is used for rapid circulation of a relatively small amount of water. This in turn ensures close and uniform temperature differences between the delivery and the return lines. You use temperature control units, when you want to preheat a process to the desired operating temperature. The heater and cooling valve works together to give fast and accurate response to bring the water up to desired temperature or to change the settings when needed. This controls your circulating water temperature. Upon reaching your desired operating temperature the TCU can continue to add heat or convert into a cooling device by exchanging a small amount of circulated water with cooling water from an external source. Modern TCU have the controls wherein cooling water is precisely metered into the system by the cooling valve. Most TCU’s in rubber industry for your machinery has temperature control from 30° to 300°F and designed for easy maintenance. Summarizing, rubber processing under optimal temperature conditions is a must for your final product quality. And the features of TCU makes it irresistible as an efficiency enhancing ancillary equipment, which control process temperatures on your rubber machinery. Thus worth your investment. Categories: Allied Machinery, Calendering Machinery, Compounding Machinery, Extrusion Machinery, Lab Equipment, Mixing Machinery, Non-Tire Rubber Industry, Tire Industry | Tags: ancillary equipment, calenders, efficiency, extruders, Internal Mixer, portable, Rubber Machinery, rubber processing, self-contained system, TCU, Temperature Control Unit | Permalink.